Members can play at any time during the week and at weekends dependant on weather conditions. A Club Day is held each Tuesday, starting at 10-00am. Indoor sessions are held at the same time. Why not come and join us? All equipment is provided and you only need a pair of flat soled shoes suitable for walking on a lawn. You can drop in any time when we are playing or call one of the contacts listed opposite. Golf League Winners – 2006. 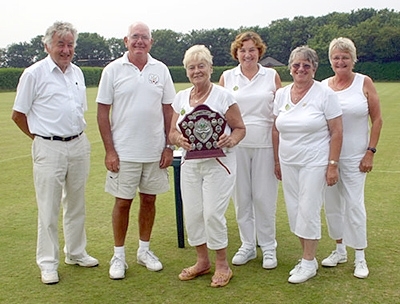 Culcheth Croquet Club was formed in 1996 with the aid of a Millennium Sport for All Grant. Our aims are twofold, to promote the game of Croquet and thereby to foster friendship. We use the lawn at the rear of the Hall in the summer season (from April to end September – lawn condition permitting). In the winter months we play indoor croquet in the Hall Extension, as we have our own carpet. Although we have had quite a high turnover of members we have a strong core of about 12 enthusiasts. We mostly play Golf Croquet but nurture the hope of establishing Association Croquet as well. We are affiliated to the Croquet Association and also to the North West Federation of Croquet Clubs (NWFCC). Both the Croquet Association and The Federation help us in many ways providing advice and coaching facilities at Culcheth Sports Club. The Federation also hold their Spring and Autumn meetings here. We have a team in the NWFCC Golf Croquet League and play League matches on a home and away basis at times arranged by agreement with our opponents, often at the weekends. Culcheth Sports Club, near Warrington in Cheshire is a local facility providing a wide range of sporting and social activities for the community. In addition, the Club is an ideal venue for Meetings, Seminars, Conferences and Training. There are function rooms of all sizes which can accommodate parties of up to 350 people making the Club a first class location for your Wedding Reception, Birthday Party, Anniversary Celebration, Sportsmans Dinner etc. The in-house catering is second to none!